I first discovered Lauren Taylor's work when her stunning illustration of Oprah to celebrate her insanely inspiring Times Up speech at the Golden Globes was doing the rounds on Instagram. 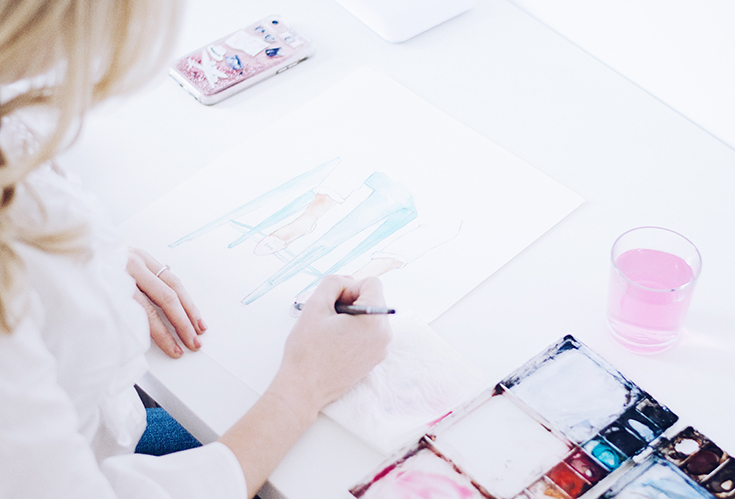 Not only does Lauren have her own shop, she also does commissions and has created custom work for some incredible brands including Victoria's Secret and Chattam and Wells. 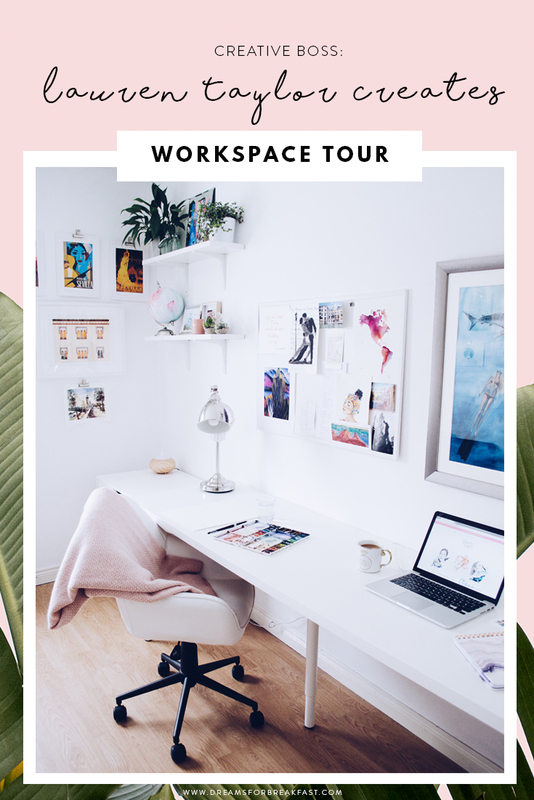 I could not be more excited to be featuring Lauren and her gorgeous studio tour on the blog today, and hope you are as inspired as I was to learn more about her story; how she built her business; plans her goals; as well as giving us an insight into her creative process. Thank you so much for being here Lauren! Tell us about you; your biz and how you got started. I grew up in a small town in Northern California. I always loved creating art, ever since I was really young I was drawing and painting. As I got older, I chose to pursue something a bit more “practical” and got a degree in International Business. I left California and moved to Oahu to study at Hawaii Pacific University. While in college I still painted and always felt the need to create - it was my outlet. I studied abroad in Sevilla, Spain my Junior year and that’s when everything changed for me. Living abroad made me want to explore the world and travel. When I returned to Hawaii from Spain, I was painting a lot more and wanted to share my work with others. I started my business with a few paintings and an Etsy shop in 2011. After another two years on Oahu, I was feeling unfulfilled at my full-time job as a news producer, so I decided to move back to California, save money, and travel through South America for a year. In Hawaii I was already working on Lauren Taylor Creates on the side, and when I moved back to California, I continued to paint while working another job. I moved back in September 2013, and by November I started offering prints from my two most popular paintings. That Christmas I sold more prints, custom and original paintings than I had to date. Selling that artwork and working with new clients made me realize if I worked while I traveled I wouldn’t have to stop after a year, I could move around indefinitely. In 2015 I left for Buenos Aires, Argentina with my clothes in a backpack and my painting supplies in my carry-on. I traveled through South America for 7 months and painted along the way. While there, I met my now fiancé James who was also traveling, and I’ve now settled with him in Ireland. Everyday is so different! I try to keep my morning routine and bedtime routines the same everyday to create some structure and set certain days for certain tasks - Mondays are for admin work, Tuesdays are for client projects, etc. Do you have a morning routine or any rituals that help set your day up for success? I do! Each morning after waking up and brushing my teeth, I make my bed and then make hot lemon water with honey. While it cools down (I hate super hot drinks) I meditate with the Calm app for 10 minutes. I then shower and get ready for the day (even if I’m staying in my studio all day I change into real clothes) and then make breakfast. Sometimes I go to the gym and then do my morning routine and sometimes when my fiancé is off work we start our day with a walk or hike if it’s nice out. How do you plan your goals? Take us through your annual planning process (if you have one) and how this plays out on a monthly, weekly and daily schedule. In the past I haven’t been great about checking in with my goals throughout the year. I’d make a list of goals in January and then wouldn’t look at them until December, feeling a bit disappointed if I didn’t hit all of them. This year I’m trying to do things a bit differently. First thing I did was make a list of things that went well last year and my accomplishments (It’s easy to look forward and think about the things you haven’t done, without looking at the amazing things you have!). I then looked at what I could have done better (I don’t want to repeat mistakes from before). I then made a big list of absolutely everything I would like to do this year, then narrowed it down to 3 business goals and 3 personal goals. I have an annual calendar and try to roughly plot out my goals throughout the year and then work backwards on how I can accomplish this goal. By planning out start dates and deadlines I’m trying to hold myself accountable in accomplishing the things that are most important to me. What are your favorite tools and apps for staying organized? My favorite tool for staying organized with commissioned paintings and projects is Pipedrive. It’s a pipeline management tool that lets you create different stages of a sale. I have two pipelines, one for client acquisition up until the invoice is sent, and then another one for each stage of the painting. It’s so simple to use and set up and has made a world of difference in keeping track of clients and what stage I’m at for each project. Another app I just started using is the Moment app. It tracks your phone usage and sends little reminders every 15 minutes you’ve been on your phone. Since I work for myself, it’s easy to get sucked into the Instagram or Facebook hole and lose half your day to scrolling. Having an app that can hold you accountable helps! Do you use a digital or paper diary? I use a paper diary. I love writing things down and making lists. I plan out my week in my planner and then list out each evening what exactly I need to accomplish the next day. I keep it to a maximum of 3 “must do” tasks each day and try to get those started first. 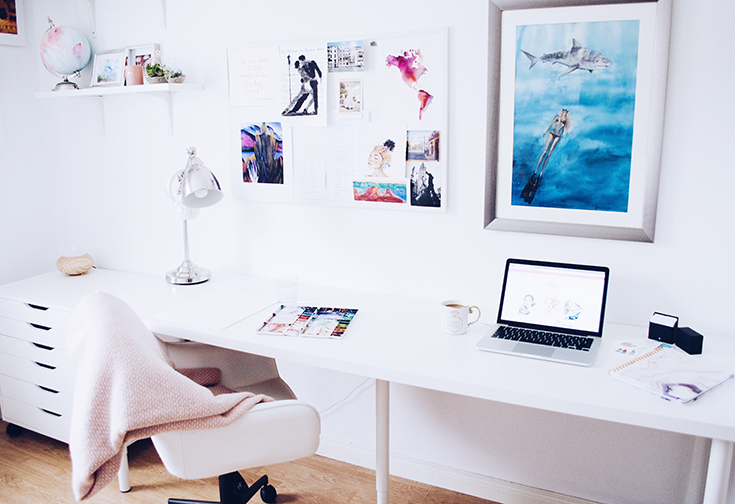 What are your favorite stores or tips for decorating your workspace? I tried to think of functionality first. 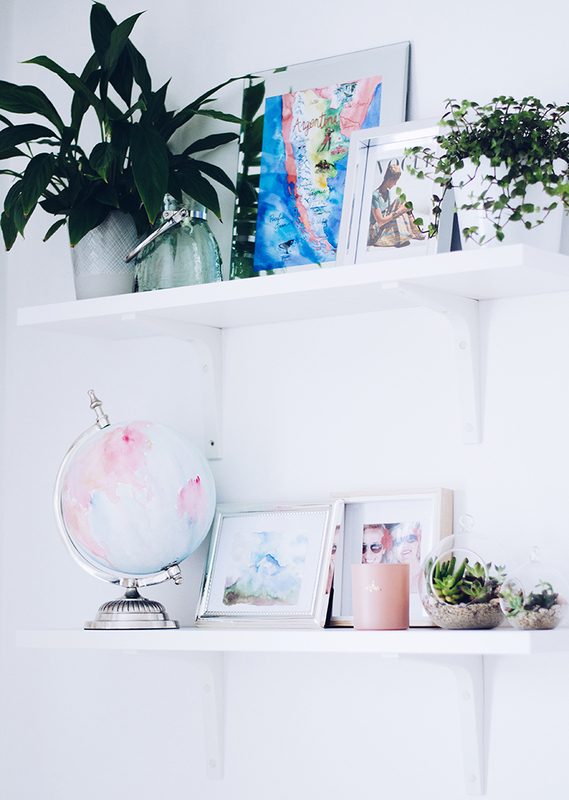 It was really fun looking at Pinterest for inspiration of how I wanted my studio to look and feel, however I needed to create a space that was going to work for me, not just be picture perfect. For example, I really like to spread out, so having a nice long table was really important for me. I found this two person desk at Ikea that is perfect for that. To hang my artwork I used blu tack and simple metal clips. This gives me the flexibility to change the artwork based on what I’m working on without marking up my walls. I also got this chest of drawers at Ikea that is on wheels. Not only is it great for storage, but since it can move around, I’m able to move it by the window when I want to use it for a flatlay backdrop and need a bit of extra light. 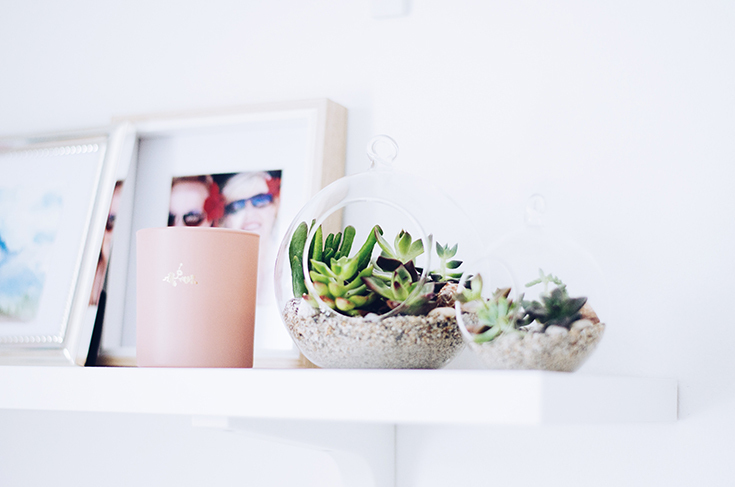 Once I got the main furniture in, I had a bit of fun filling my space with things that I love and that inspire me. I definitely recommend Ikea for furniture and small local shops or secondhand stores for accessories. Best advice for staying productive and getting sh*t done? Remove distractions! I am the type of person who will check my phone all day and look at cake and nail videos on Instagram. I’ve found that if my phone isn’t close by I don’t miss it. I’ve also used website blocking apps to block sites like Netflix and Facebook during working hours. Favorite way to re-charge your creative-juices?